Ok so here goes, My Mum has cancer. Phew hard one to say. But what has that got to do with Wandering with Chris you might ask. Well its my way of relaxing and having me time and our way of having time together because having cancer means you get to visit the hospital a LOT and i am the one person in our family who gets to do the caring. It’s much harder than i ever expected, i knew from a very early age that when our parents became older/pensioners that out of me and my sister, well it would fall on me to care. I am sad, my heart feels as if it will break, i don’t WANT my Mum to be suffering this way, who would and going out all day, just one day a week is my way of dealing with and getting a way from all of the appointments, hospitals, medications etc that go with his horrible disease. Chris is my back up, he is there whenever i need a hug or to cry or to rage and he is also my navigator (in more ways than one). I say i want to go and find, say, windmills or old buildings and he gets on google maps and finds us places to go, then directs us, my own personal tomtom sat nav lol. We have wandered a lot, around Wirral, Liverpool, Wales, some places we will go back to again, others were not really very good. This is about our wanderings in Eastham, Wirral. So a bit about Eastham. Since the Middle Ages, a ferry service operated across the River Mersey between Eastham and Liverpool, the early ferries being run by monks from the Abbey of St. Werburgh. By the late 1700s, up to 40 coaches each day arrived at a newly built pier, carrying passengers and goods for the ferry. Paddle steamers were introduced in 1816 to replace the sailing boats, but the demand for a service declined in the 1840s with the opening of a railway link between Chester and Birkenhead Woodside Ferry. In 1846, the owner of the ferry, Thomas Stanley, built the Eastham Ferry Hotel and shortly after, the Pleasure Gardens were added to attract more visitors. The gardens were landscaped with rhododendrons,azaleas, ornamental trees and fountains. Attractions included a zoo, with bears, lions, monkeys and antelope, an open air stage, tea rooms, bandstand, ballroom, boating lake, water chute and a loop-the loop roller coaster. Entertainers performed in the gardens during summer, and included Blondin, the famous tight-rope walker who once wheeled a local boy across a high wire in a wheelbarrow. In 1894, the Manchester Ship Canal was opened by Queen Victoria, bringing added prosperity to the area and a Jubilee Arch was built at the entrance to the Pleasure Gardens in 1897 to commemorate her Diamond Jubilee. 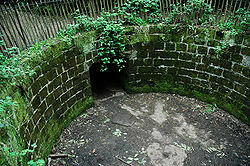 The ‘Bear Pit’ at Eastham Woodland & Country Park as it stood in 2006. In its heyday Eastham Ferry was known as the ‘Richmond of the Mersey’, but its popularity declined during the 1920s and the last paddle steamer crossing took place in 1929. The Pleasure Gardens fell into disrepair during the 1930s and the iron pier and Jubilee Arch were later dismantled. In 1970, to commemorate European Conservation Year, the area was designated a Woodland & Country Park and today, it is once more a popular place of recreation. So it was to the country park that we went. We haven’t been there for many years and we were pleasantly surprised at how nice it was. We wandered and chatted to some lovely people, there was a lot to see and nearing the waterfront there were boats going past, the sun was shining on the water, it was just a lovely day. The park is large, we covered just a small section of it so we will have to go back, wandering with Chris is a great way to explore where we live and doing it with someone who means so much to me is a great way to spend a day. Chris is @clawfish, velvetmedia.wordpress and clawfish soup on tumblr. Please, drop by and read his great poetry. Thanks. A chance find on youtube and Photomatix Pro is my new toy.